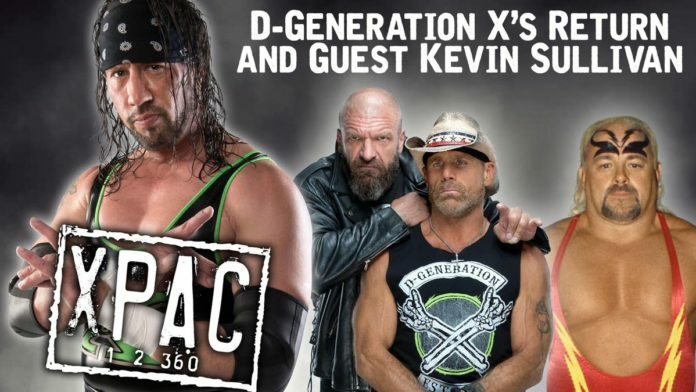 Sean Waltman discussed the return of D-Generation X and Triple H undergoing surgery this week on the the latest episode of his X-Pac 12360 podcast. While the return of DX and Shawn Michaels’ return to the ring for the first time in eight years held promise of a nice bit of nostalgia, the match between DX and The Brothers of Destruction at Crown Jewel fell apart when Triple H tore his pectoral muscle, which required surgery. Waltman experienced a similar injury during his career and was impressed that his longtime friend finished the match. Waltman also had high praise for Michaels, who stepped back in the ring at 53 years old. “Shawn went out there like a boss and held that match together. He looked better than anyone in that match. The guy who hasn’t had a match in the better part of a decade. Not slighting Paul, because Paul always looks great out there, but Shawn was just a pleasure to watch,” Waltman said. Waltman also discusses why wrestlers have long hair, the upcoming Survivor Series card, and interviews Kevin Sullivan, all on this week’s X-Pac 12360. The full episode can be heard below. When referencing this transcript, please credit SEScoops.com. This transcript has been edited and condensed for clarity.